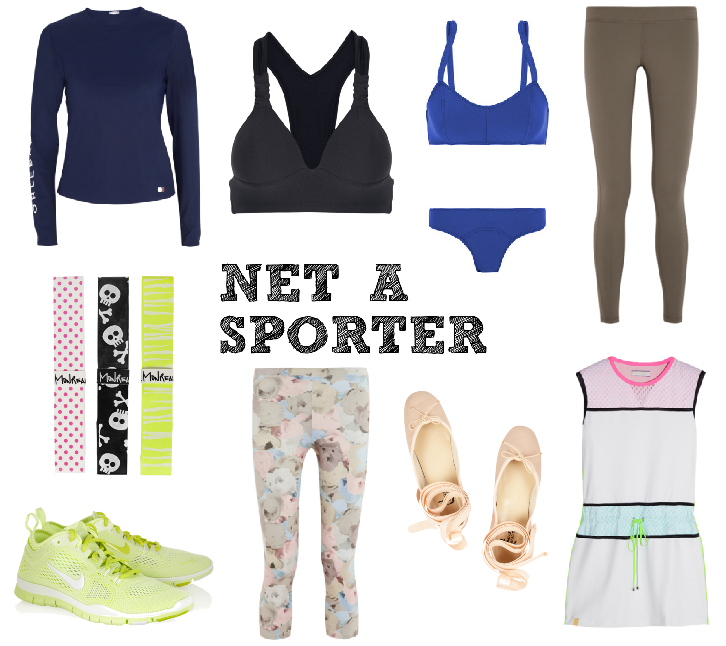 Just when I'm looking for new inspiration to keep fit, the clever team at Net A Porter launches their new (play on words) website, Net A Sporter. I mean, as if anything more than a store dedicated to looking good to encourage you get off your bottom and do something about your ever increasing thighs... (or so be it in my case). So many people have told me to invest in good workout gear in order to inspire me to enjoy sports again, but the issue for me up until this point as been where can I do this? Net A Sporter solves that very problem for me. Hundreds of curated items, most of which I'd happily wear (not quite at the Zimmermann bikini stage, and don't worry I won't be subjecting you to a lycra fuelled outfit post anytime soon)... Whats great about the site is the buy, their team have clearly put so much thought and energy into the selection of items available. I know no idea that brands like LemLem existed (I mean these shorts are just so nice), and would never have found them beforehand. It also solves problems like where to find a bikini thats nice enough to be seen in, but sporty enough to workout in - laterz Speedo, hello Lisa Marie Fernandez. And how times have changed - gone are the days you and your mum have to wonder into a strange, old school style shop to buy your ballet shoes. Nope, kids of this generation can buy them on a fashion website. Amazing. On top of that long standing Net A Porter brands like Zoe Karssen and Splendid who are included in the Sporter section, get a new lease of life - or at least perspective, I would never have considered buying these to work out in for example. In the same vein, did you know sock brand Falke did sports jerseys for a very reasonable £45? Current Elliott do sweat pants? Nope me neither. Well done NAP people, you've nailed it again - whats next: Net A Bebe? Maison? Vacances? Whatever it is, I'm in. Wow, can't wait to check out Net A Sporter and love your recommendations! Cannot wait to start shopping here! [Feature] Whats In My Rucksack?